Athens, GA (Dec 18, 2007) - I am down in Orlando, FL for the annual IBM Lotusphere Conference, feeding the side of my life that pays the bills. I am also covering the conference for NowPublic and NewsVine. I hate to break it to the sports writers out there, but I have a press credential to provide this coverage. Staying at the Swan and Dolphin Hotels on Disney property, you cannot sing country-western music in the Karaoke bar because Disney has banned it because the Japanese tourists find it depressing (or so we have been told). But flipping the TV channels in the wee hours of the morning, what did I find? Sumo Wrestling. 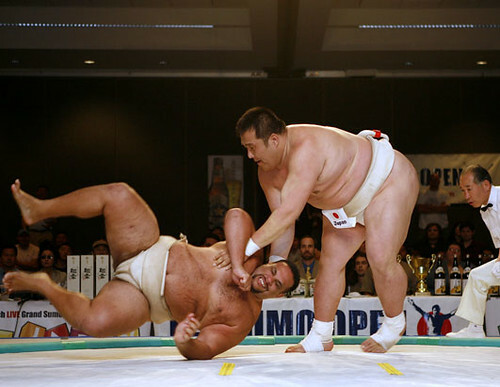 Not just any Sumo Wrestling, but the 2008 January Grand Sumo Tournament! Talk about being lucky enough to find that! I may not be able to sing "Friend in Low Places", but I can sure watch the Sumo tournament.